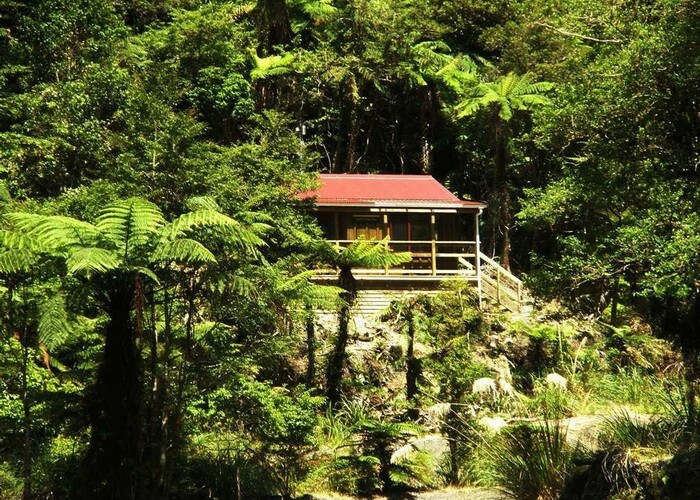 North Ohau Hut is a cozy 4-bunk hut in the middle reaches of the North Ohau River in the Tararuas. A joint project of Horowhenua Deerstalkers and DoC. The best designed of small huts built in recent years: fully insulated, light and including a wood-burner and 4 bunks. The deck is almost as big as the hut, with a view over the river. A great hut and a great sign if this to be the template for future construction. Who says small huts can't have a fire! Access is not simple, meaning this hut doesn't get a huge amount of use. Most people walk up the Ohau River which includes at least one gorge. The river changes after each flood, but count on getting your shorts wet. Great work has been done on cutting 'Al's Track' up the ridge behind the hut to pt 897 (starts behind the longdrop). From the ridge a good spur 300m to the north leads to the Mangahau river 2km above Mangahao Flats hut, or the ridgeline south takes you to for Girdlestone Saddle. South Ohau Hut • By mantis. Licence: C.
Added 16 August 2010 by madpommadpom. 2 revisions, most recently 16 August 2010 by madpommadpom. 703 views in the past year (59 per month).